Many summer planters are looking a little tired right about now. I know mine sure are. It is still too hot for many fall annuals and there are slim pickings in the nurseries. I don’t know about you, but I want to stretch summer a bit longer and am not quite ready to switch my entrance and patio décor to full blown fall. My solution? Bring a little bit of fall to summer planters. 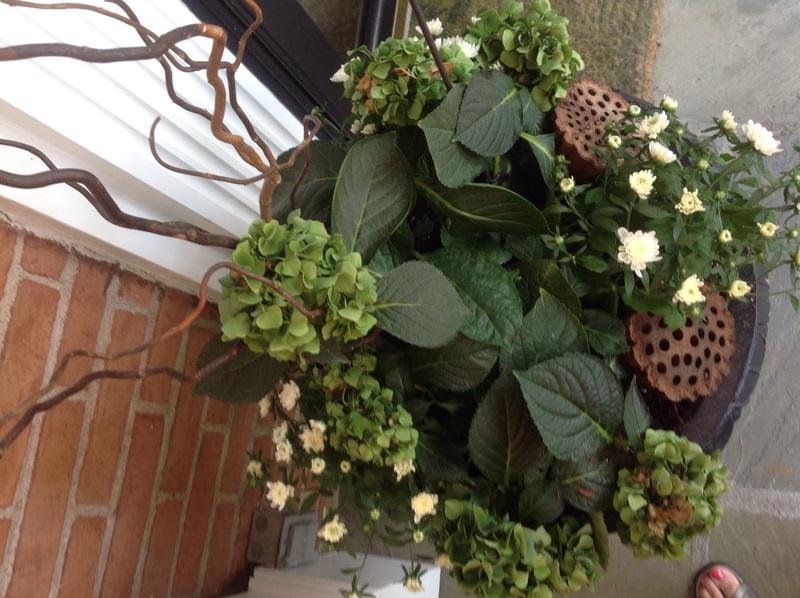 To freshen up my entrance’s potted hydrangeas, I pulled out tired trailing annuals and nestled in some mini white mums and some dried lotus seed pods. It’s not even September and I’ve bought a few mums! There is a hint of fall with the mums and dried pods but still a lot of summer in the green and white color scheme and the lingering hydrangeas. The curly willow branches compliment the dried lotus seed pods nicely. I switched out my summer wreath for a monogrammed basket of green apples and mums. To see how I made it, please click here. 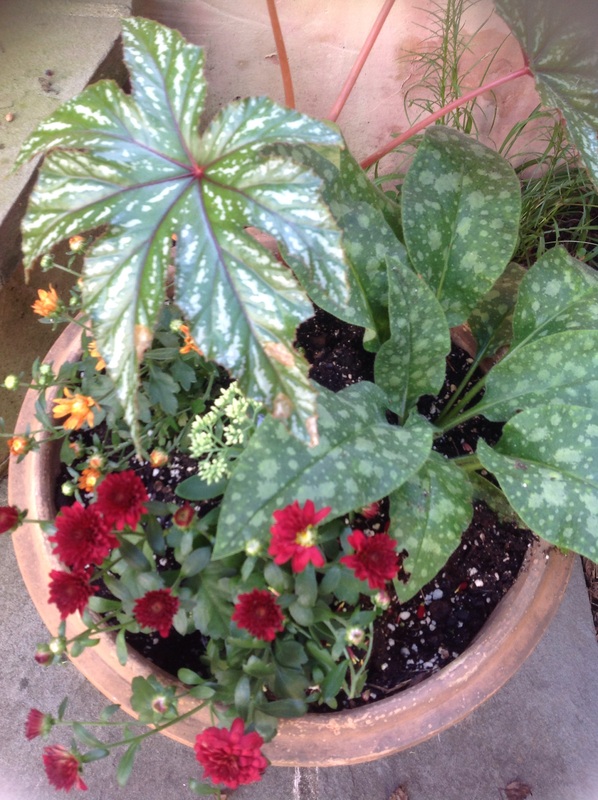 Another planter of perennial brunnera, sedum and fancy leaf begonia was refreshed with the addition of 2 mini mums on a side patio. Totally perked up and ready for fall! Several of my favorite garden planters are filled with perennials that come back year after year. I tuck in small annuals here and there when the planters need a boost. They require less watering than annuals and pretty much zero maintenance. Gotta love that! 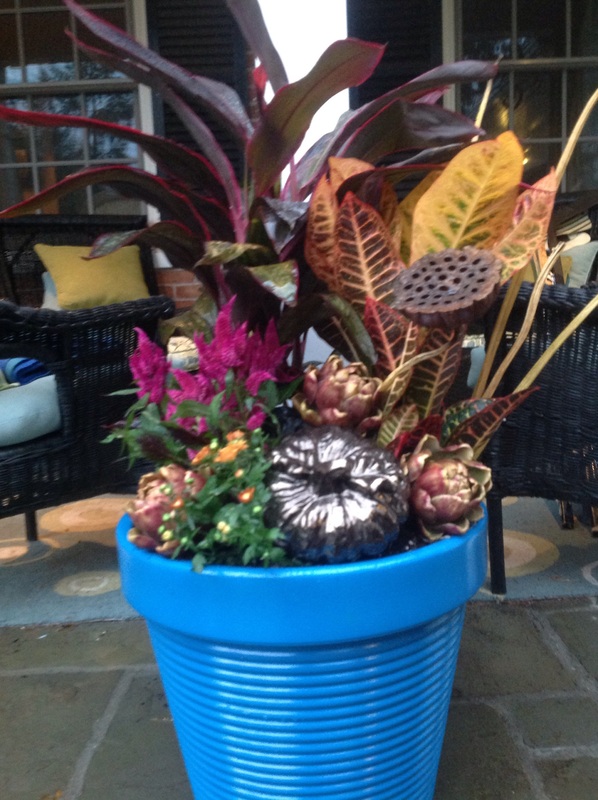 Thinking ahead of bringing plants indoor, I invested in a couple of indoor tropicals and created a transitional fall planter I can enjoy now and bring indoors for winter later. 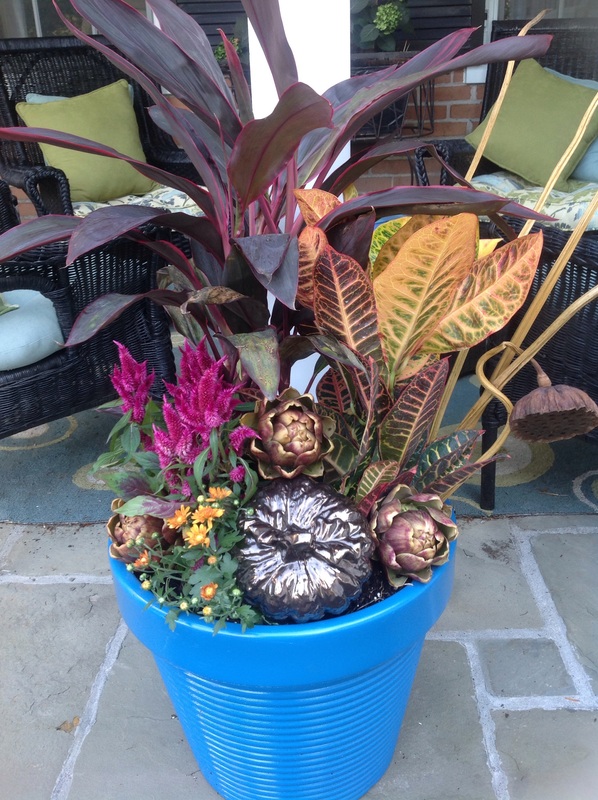 I used a bright jewel toned planter and filled it with tall indoor tropicals: a varigated ginger and a colorful croton with its thick, leathery leaves. I loved their height, texture, shape and rich jewel tones of purples, fuschia, golds and oranges. 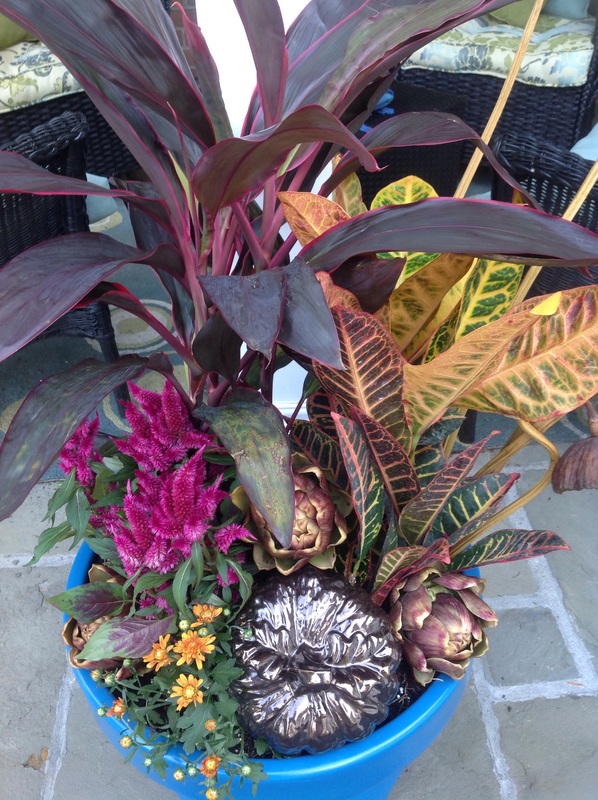 I added a brilliant fuschia spikey cadmium to compliment the varigated ginger, some lotus pods and their sturdy stems, golden mums to pick up on the croton plant’s firery colors, a bronzed ceramic pumpkin, dried lotus pods, and some waxed purple artichokes. The bronze pumpkin won’t rot in the lingering heat and it is a more subtle nod to fall than a bright orange one. 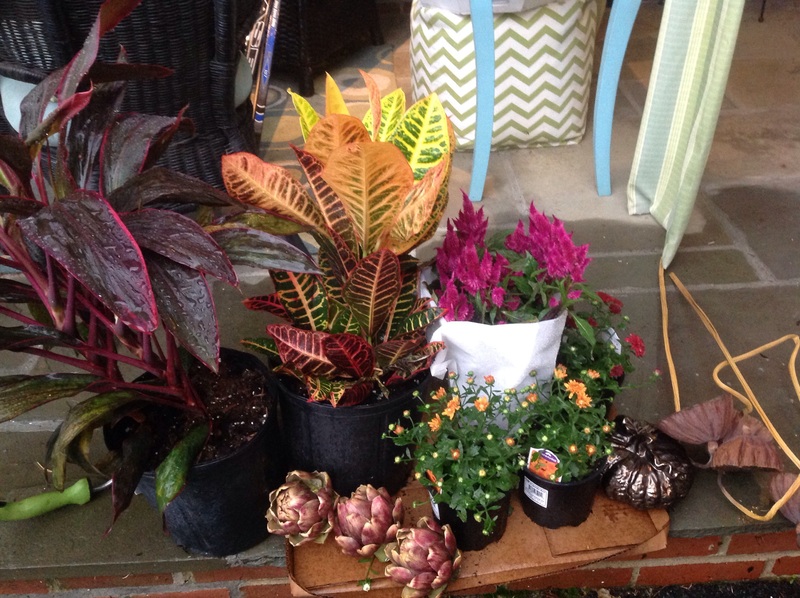 The plant materials I started with: tall varigated purple ginger with the leaves edged in pink, a mutil-hued croton with its bright yellows, lime, pink and oranges, a fuschia celosia, gold mums and seasonal fillers I had around: lotus pods, purple artichokes, a bronze pumpkin. Playing around with the plant arrangment, this is how the planter came together. To me this planter still says summer but that fall is around the corner. The whole planter cost $30.00. in new plant materials. Close up details. Once the weather is too cold for the tropicals, they will be brought inside for further enjoyment throughout winter. I will swipe out the mums and pumpkins for some indoor begonias or other indoor flowering plants. 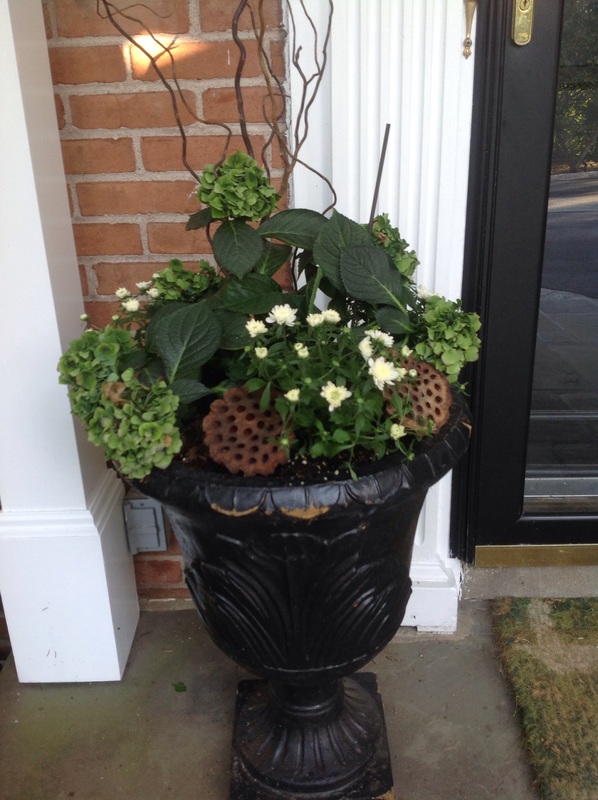 How do you transition your garden planters into fall? I hope I inspired your creativity! 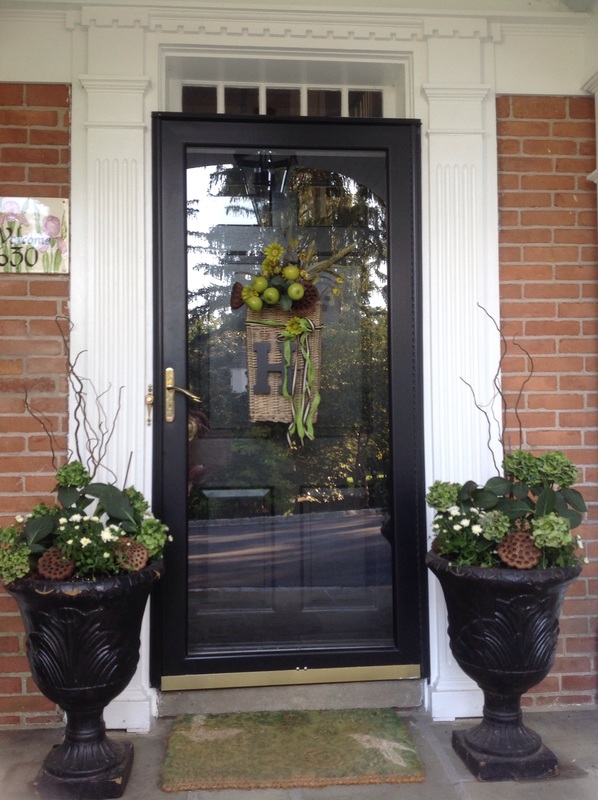 This entry was posted in Gardening and tagged adding pumpkins to fall planters, Fall front door basket, Hydrangeas in pots underplanted with mums, lotus pods in planters, monogrammed fall door basket-wreath, sprucing up tired summer planters for fall, Summer into fall planter, using tropical plants in fall planters by Johanne Lamarche. Bookmark the permalink. You are just so creative, Johanne, it really reminds me to make a bit more of an effort! Gorgeous! I really need to do this! Thank you Julie! I expect it’s still very hot in your part of the country. It was a cool week, but this next week heats back up to 91 degrees F.
Lovely arrangements Johanne, are you trying to get a head start on Fall? I know what you mean though, right about now the planters are looking a sorry sight, so kudos to you for the re-organization. I was surprised at how many nurseries in DE were selling mums today on the way back from Rehoboth. Too hot! Glad you enjoyed the planters. I am off to travel to Ward’s Island….! Your pots are gorgeous Johanne! Most of my flowers are spent, given up after a long hot Alabama summer. It will be too hot even for mums until Oct so I usually just pop big pumpkins atop the urns flanking the front door. I love your eclectic mixes!